An electric guitar played by The Beatles' George Harrison has sold for $657,000 (£390,000) at an auction in New York. Harrison played the 1962 Rickenbacker 425 guitar on British TV shows like Ready Steady Go! in 1963, prior to the band's US invasion in 1964. The Beatle, who died in 2001, also used the instrument during the recording of I Want to Hold Your Hand and This Boy. He bought the guitar during a visit to the US. Its pre-sale estimate was up to $600,000 (£356,000) said auction house Julien's. It topped the previous sale of a VOX guitar played by both Harrison and Lennon in May last year which fetched £269,000) but fell far short of the record $965,000 (£591,000) set by a Bob Dylan guitar in December. The auction also included a handwritten placard with doodles signed by John Lennon and Yoko Ono from their 1969 anti-war protest in Montreal, which fetched $187,000 (£111,000). 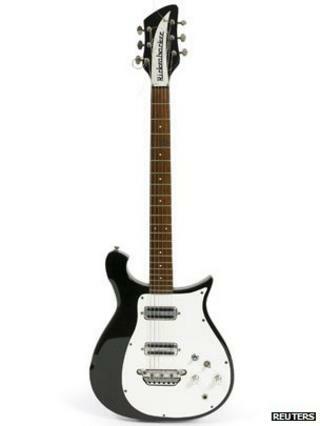 A Hofner bass guitar rented by Sir Paul McCartney in the mid-1960s sold for $125,000 (£74,000). A white jumpsuit worn by Elvis Presley during a 1971 concert fetched $197,000 (£117,000). Image caption The VOX guitar was bought by an unidentified US buyer in New York.